You may surmise that the gifts listed are likely to be fancy and expensive ones, but on the contrary, they are all reasonable and simple gifts, particular DVD and book titles, chocolate coated almonds and a paper trimmer for craft projects are among them. When I saw this detailed array of lists I was rather amused and one of the first things I said was, ‘Why don’t you just go out and buy these things instead of waiting for someone to give them to you’? It dawned on me soon after that my comment said more about my general outlook than Jane’s lists. I realised that the reason I don’t really have a wish list is because if I had wanted a book or a DVD or a paper trimmer I would just go and buy it at that moment – and I mean at that moment – Jane will tell you how I can have an item searched for and purchased via the ebay app before she’s even finished talking about how much she likes it. The reason Jane tells me she keeps a wish list is because it helps her separate what she actually needs from what she actually wants. 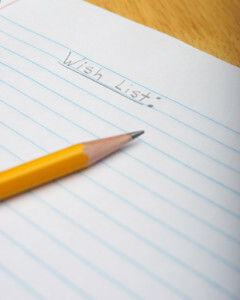 I think I have realised then that a properly kept wish list is actually a subliminal sign of patience, it is a list that demonstrates a person’s ability to exist without the ever growing amount of ‘stuff’ that we all seem to compile. Just as “Video killed the Radio Star” back in 1979 perhaps a lack of contentment with life and the convenience of MasterCard has killed the wish list. One of the aspects I found most fascinating about Jane’s wish lists is that some items have been on the list for years…yes…years! So if something is not given at a particular occasion it becomes a reminder to simply make do without that particular want and focus on using ones current possessions well. Perhaps you all have thought out and venerable wish lists and this article is only serving to show my personal weaknesses, but with a national credit card debt hovering around the $50 billion mark, I am guessing it isn’t just me. Perhaps our love affair with credit cards and new technology and buying ‘stuff’ all the time is the underlying fruit of a people who are selfish and individualistic. Instead of believing that we can be happy the way we are, instead of keeping our iPhone 4, instead of waiting for someone to gift us with what novelties we would like, we label our wants as needs and convince ourselves that our personal satisfaction is dependent on that latest product we must possess. I have a room full of books and while they are excellent books I certainly have not read them all. Perhaps the growing quantity should serve as a reminder to me that not all of life’s bookshelves must be filled in five minutes. After all, if we don’t have the ability to say no one thing, to wait patiently for another, then how will we cope when the big trials of life come our way, trials that often cannot be resolved with eBay and MasterCard. How do we cope when waiting to meet the right person, dealing with trials in marriage or looking for work if we have no practice at the art of hope-filled patience? So perhaps I have been inspired to start a proper wish list for the future. I might see it as an opportunity to build character and learn to wait patiently for the good things in life (and to be understanding when they do not all come my way). I just hope I don’t still have the same items sitting on my list in five years’ time!